Gaming is big business for many Native American tribes. 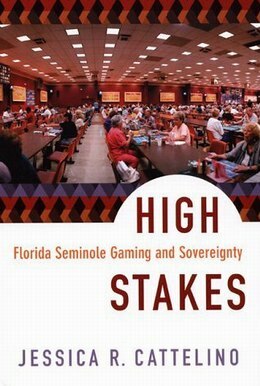 For the Seminole tribe in Florida, gaming wealth enabled them to revive traditions and celebrate their culture in previously unimaginable ways, anthropologist Jessica R. Cattelino writes in her new book High Stakes: Florida Seminole Gaming and Sovereignty. Cattelino conducted fieldwork on the Seminoles'’ six reservations, attending everything from tribal council meetings to birthday parties, and learning about the texture of everyday life according to a press release. The Seminoles are often credited with opening the door to Indian gaming in 1979. In 2006, they stunned the world in 2006 with its $965 million purchase of Hard Rock International, an empire of restaurants, performance venues, hotels and casinos in 45 countries. Cattelino found that the Seminoles’ estimated $1 billion in annual gaming proceeds has opened the door to a wealth of opportunities. On the one hand, more and more expensive new vehicles fill tribal parking lots and driveways. On the other hand gaming proceeds have allowed the tribe to erect an social safety net that includes universal health care, financial support for unlimited education, full senior care and generous reservation amenities, from gyms to community centers. A new market for high-end Seminole crafts has emerged, fueled by the collecting potential of the Seminoles themselves. Local schools now incorporate traditional practices and native-language instruction into their curricula. New positions as cultural educators, tribal museum officials or language instructors have opened up. Since the mid-1960s, the U.S. Bureau of Indian Affairs (BIA), in collaboration with the U.S. Department of Housing and Urban Development, had pushed tribal members into individual, cement-block homes arranged without regard to extended family ties. But the new wealth has allowed them to take control of tribal housing, ushering in a return of native construction styles, traditional structural elements and housing arrangements that cluster residents according to Seminole matrilineal clans, Cattelino found. And the Seminoles use their wealth to help other communities. They have contributed to Hurricane Katrina relief, the National Museum of the American Indian in Washington, D.C., and numerous local causes. Although I am not a fan of how some of the gaming facilities have taken over the livelihood of many tribes, I do believe they have been a boom for tribes. It has given them the monies to establish language programs, fisheries, and many other activities that help maintain and rebuild their culture and traditions. All in all, I’m in favor of them. Yes, I wonder about the impact on the gamblers, many of them Seminoles as well, I suppose (ref How slot machines are exploiting peole). Do you know anthing about this? Jessica here, the author. Thanks for blogging about the book. In fact, Seminoles haven’t been especially active gamblers – tribal members use the facilities more for restaurants and meeting rooms than for gambling. Meanwhile, the Seminole Tribe of Florida is trying hard to diversify (buying Hard Rock International was the splashiest effort, but for example just this week they launched an intertribal buying consortium that will focus in part on meat production). No doubt, though, gaming is still the big money-maker. Thanks alot Jessica for this information!